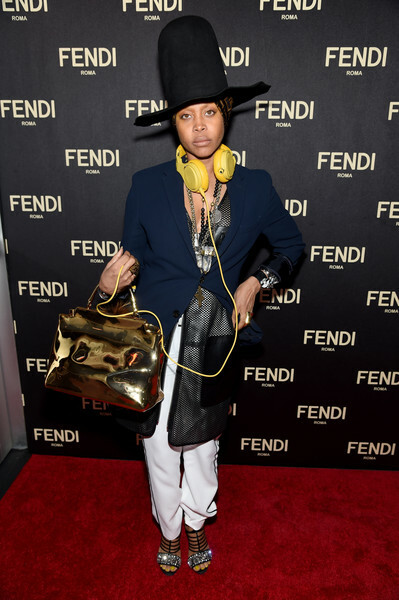 Erykah Badu aka DJ Lo Down Loretta Brown attends FENDI celebrates the opening of the New York flagship store on February 13, 2015 in New York City. Erykah Badu teamed a blue blazer with a black net coat and white slacks for the Fendi New York flagship store opening. Erykah Badu glammed up her outfit with a pair of crystal-encrusted strappy sandals. A metallic gold Fendi tote added major shine to Erykah Badu's look.